You are here: Home / 1. 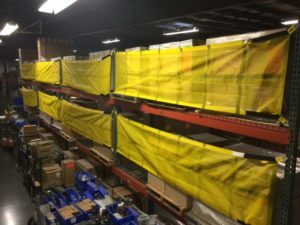 Warehouse Safety / Do I Need a Fixed or Sliding Safety Net? Better protection for your business and employees starts with better products. Choosing the right pallet rack safety solution can make your work safer and more efficient by preventing accidents and broken inventory. Rack safety nets may be the perfect solution. They protect the items on your shelves and the employees who work around them. But whether you need fixed or sliding safety netting depends on your specific needs. Find out which may be the best option for you. Large items and pallets can be easily secured with fixed rack safety nets. This is a great option for containing inventory and maintaining an organized workspace. Fixed rack safety nets fit to both the front or back of the rack, though they are primarily used on the back. Thus, objects don’t slide down into the flue space or fall to the floor. With 2” wide polyester straps, Adrian’s Fixed Rack Safety Net provide high-quality construction with durable materials ensure lasting performance. And the bright yellow mesh helps to make safety checks go by more quickly. We were able to install the same amount of safety netting in 30 minutes that used to take us nine hours with the metal caging. We also saved thousands of dollars in the process. When your operations require constant access to items in the bays, you may benefit from sliding nets. They deliver the security of fixed nets without uninstalling and reinstalling. Simply push the netting aside, and you’re able to move, load, and reorganize rack space as often as needed. It is the perfect solution for distribution centers with pick-and-pack operations. Adrian’s Sliding Rack Safety Net offers the same material specs as fixed nets. In addition, they offer the added convenience of extra guide straps installed along the top and bottom of each rack. You get the versatility you need while keeping your work area safe and the walkways free of hazards. No matter which option you decide is right for you, Adrian’s rack safety nets allow you to get set up with zero fuss, thanks to an easy-to-install design. Our nets come in a range of standard sizes, and custom sizes are available for minimum order quantity. Contact us to discuss your safety solution needs.